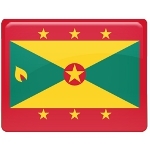 Grenada's Independence Day commemorates the country's independence from the UK in 1974. This public holiday is celebrated on February 7 each year. Grenada is a small island country in the southeastern Caribbean Sea. It consists of the island of the same name and a number of smaller islands. The first Europeans to settle on the island of Grenada were the English, but their settlement was destroyed by the indigenous people in 1609. In the 1650s, Grenada was conquered by the French and became a French colony. However, during the Seven Years' War the British captured the island. It was formally ceded to Britain by the 1763 Treaty of Paris. During the American Revolutionary War the French managed to re-capture Grenada, but the 1783 Treaty of Versailles restored the British rule. In 1877, Grenada became a crown colony of the British Empire. The struggle towards its independence began after WWII, when the colonial system began to decline. In 1950, the Grenada United Labour Party was founded. A year later, it won 6 of 8 seats contested in Grenada's first general elections. In 1967, Grenada was granted full autonomy over its internal affairs as a West Indies Associated State. On February 7, 1974 Grenada's independence was declared.